The Volkswagen scandal has opened the eyes of people everywhere. The use of tricky software to circumvent emissions standards created by the EPA changes our perception of the auto industry. If the world's largest automaker can cheat us for years, does VW deserve the respect and the devotion drivers bestow on some of their finest cars? Even worse, other auto brands may have been doing the same sort of thing, without having yet been caught. How deep this goes will eventually come out, but in the meantime, things are in flux as the scandal disrupts the auto industry from top to bottom. 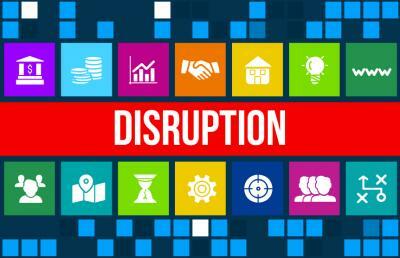 Speaking of disruption, we shift to the banking industry where scandals and credit crises are a distant memory, but disruption continues unabated. Consider payments processes where Bloomberg reports 50% of all new smartphones will have mobile wallets in them. While Asia still leads here, US adoption is expected to soar as mobile payments volume expands 1,000% over the next 2Ys. Yet, despite the hype of contactless payment digital wallets like Apple, Samsung and Google, people are still people so some odd things are happening too that might give community banks more time to react to all of this disruption. In fact, a new study from online fraud prevention company Trustev finds 21% of people in the US who have an iPhone that works with Apple Pay have never tried it. Further, of those who have used Apple Pay, 56% said they only use it 1x per week. When it comes to Samsung Pay and Android Pay, only 14% of people combined have ever used these services and of those who have, only 36% use it 1x per week. What is going on here? Well, it seems whipping out your phone and waving it over a credit card machine to make a contactless payment is pretty cool, but paying with a credit card is almost as easy so people still default to it. That makes sense when you consider 82% of people said paying with a credit card is easy or very easy. As can be seen from the data here, new technology can take longer to replace older technology if people like what they already have and find it easy to use. That doesn't mean change won't occur, but it might take longer than expected. For us, we think it will move faster than checks, which have declined, but were last counted at 18.3 billion in 2012 or about 50% the level of a decade earlier. Of note, Fed research finds while the number of checks written ranks 4th in distribution of noncash payment methods used in 2012 (behind debit cards at 38%, credit cards at 21% and ACH at 18%) at 15%, it ranks 2nd highest in terms of value (behind ACH at 61%) at 33%. Clearly businesses and people still move the largest amounts of noncash money (excludes wires) using ACH and checks (credit cards were 3% and debit cards were 2%). No matter what you think of all these new payment methods, suffice it to say that as people become more educated on them, feel better about security and see others using it, adoption rates will rise. We don't yet know if it will be fast or slow adoption, but it will occur and the payments space is officially in disruption mode. As things continue to shift around in coming years, our advice to community bankers is to continue to read and educate yourself as you monitor usage around you in your own region. We'll do the same and keep you up to speed as things move forward over time, so keep reading as well. Now we turn our attention back to VW, where we see their technology play seems destined to deliver them unintended consequences as it disrupts their business model to the tune of millions and millions of dollars. Weak retail sales, concerns over global growth and reaction to Paris attacks impacted market activity. Treasury yields dropped 5bps and Dow Jones declined for second day in a row. 1) Two bank holding company United BankShares ($12.7B, WV) will acquire Bank of Georgetown ($1.2B, DC) for about $269mm in stock. 2) Bank of the Ozarks ($8.7B, AR) will acquire C1 Bank ($1.7B, FL) for $402.5mm in stock. 3) First Farmers Bank and Trust Co ($1.4B, IN) will acquire The Citizens Exchange Bank ($60mm, IN) for an undisclosed sum. 4) Royal Business Bank ($1.0B, CA) will acquire TomatoBank ($452mm, CA) for about $100mm in cash. 5) First Midwest Bank ($9.7B, IL) will acquire The National Bank & Trust Co of Sycamore ($640mm, IL) for $71mm in cash (20%) and stock (80%) or about 1.27x tangible book. 6) Eastern Michigan Bank ($278mm, MI) will acquire Ruth State Bank ($35mm, MI) for an undisclosed sum. The FASB has voted to require banks to set aside loan loss reserves based on expected losses over the life of the loan by 2019 for public companies and 2020 for everyone else. FASB said the rule is still being written, but it expects to complete the project in coming months. BI Intelligence reports 75% of millennials visit a branch 1x per month or less and 40% don't use branches at all. Community bankers should note that facial recognition has been rolled out by HSBC, USAA and Wells Fargo so far. US Bank is expanding its financial management tool called ScoreBoard to any customer that has a credit card with the bank. ScoreBoard provides information on spending, allows users to download spending reports and habits can be compared against selected peer groups. Morgan Stanley reportedly plans to boost its savings and CD offerings in 2016, as it tries to capture more clients and increase its wealth management business.